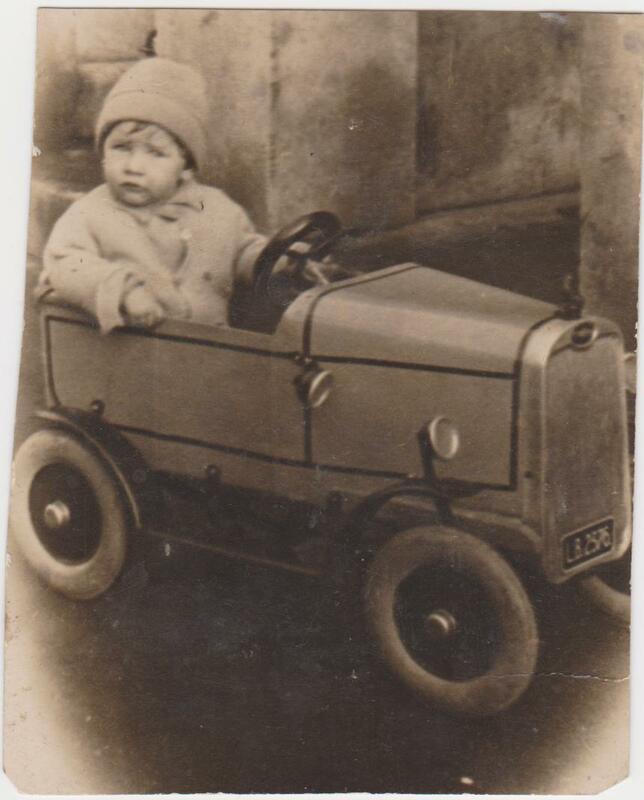 This was my brother Stanley’s car, bought for his first birthday in 1929. I’d like to have it now, I wonder how much it would be worth? Do you remember having a car like this? Or did you have some other sort of very special birthday present toy? If you would like to share your memories with us, please leave a comment below. I remember playing in one. It was red and made of tin, and pretty tough and they were very common at that time. They were propelled by two pedals for the feet which went backwards and forwards. I don’t remember a brake so I assume you just stopped pedalling! I dread to think what would happen on very steep roads. I had one of them pedal cars when I was about 6 or 7 – drove it down Albion Hill, turned into Cambridge Street at high speed, rolled over, nasty cut across the eyebrow, car went in dustbin lorry, some lucky dustmans kid got a lovely new pedal car!! Mum did that to stop it happening again, but to no avail we started using a roller skate with a book across it to balance our bums on; we could go down that hill just as fast. I supose that’s how the new-age skate board was thought up! Oh those happy days! This is my Dad, (Stanley Smith). You pedal car enthusiasts should visit the Mill Toy & Pedal Car Museum in the Old Mill just by the Kent & East Sussex (Steam) Railway station at Northiam. They have a car just like the one shown above. Well worth a visit (http://www.themilltoymuseum.com). The number plate, LB2526, stood for Lines Brothers and was their telephone number. A chap who lives in Kemp Town has written a couple of books devoted to pedal cars and children’s ride-on toys entitled “Juvenile Automobiles”. Update: The pedal car and toy museum mentioned in my earlier posting, above, closed down circa 2015. A great shame.